Last week was a tough one. Between looming work deadlines, sick kids, and some unexpected family issues, I was exhausted by the end of each day. The problem was that by the time the kids were tucked in and I could get ready for bed myself, my mind was going a million miles an hour and I couldn’t relax. 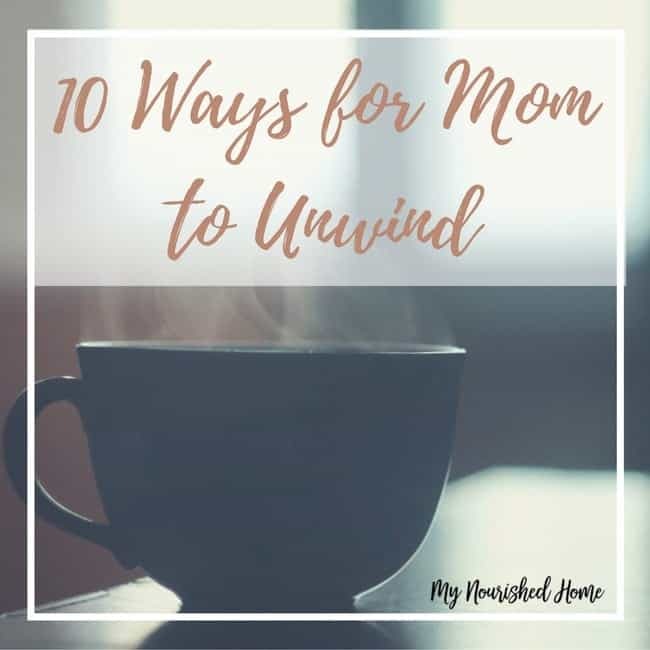 Sometimes it is hard to find ways for mom to unwind. It’s an awful feeling to be so tired and yet, so unable to unwind and let yourself rest. 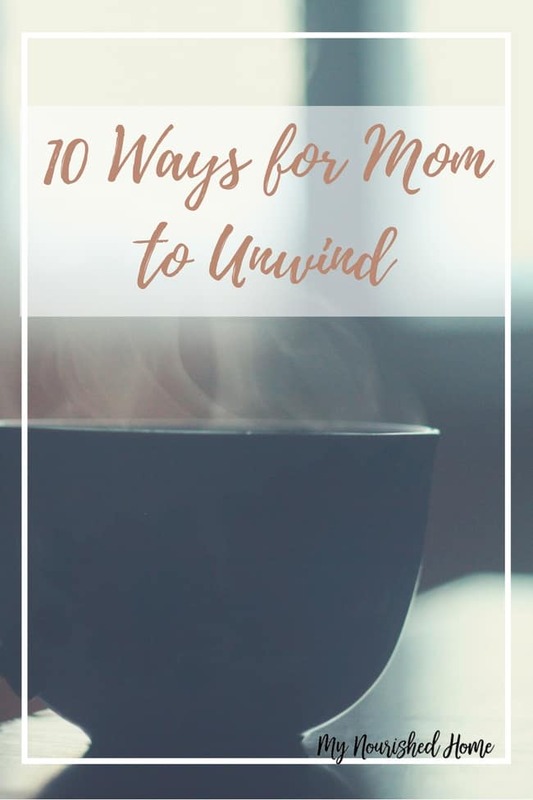 If you’re ever stuck in the same situation, here are 10 ways to unwind at the end of the day that might help you quiet your mind and release the tension of the day. Some people love baths while others prefer showers. It doesn’t really matter which one you choose as long as you get to relax under the warmth of the water. Tip: If you’re opting for a shower, try tossing in an essential oil shower melt to help you relax. We’re an oily family and essential oils are a part of our daily life. Finding a way to support relaxation was important to me when we first started, so oils like Stress Away, Tranquil, and Lavender can often be seen making an appearance at bedtime. There are so many different non-caffeinated, herbal teas out there to choose from, but my favorite is the Calming Tea from Teavana. I love rooibos and the ginger in the blend instantly soothes me. There is something really calming about making a real cup of tea with fresh, loose leaf tea. The process itself makes me slow down and relax. I’ve always had a hard time with yoga because my mind is usually too active to concentrate on breathing deeply and being in the moment. However, I discovered a quick and relaxing 10-minute yoga routine that’s specifically designed for bedtime that I absolutely love. I’ve found that at the end of the 10 minutes, I’m more relaxed and my mind is racing a lot less. Don’t pick up a book that’s going to make you think about work or give you ideas for home projects. No, instead choose a book that’s pure, happy fluff. A book with engaging characters, a bit of humor, and no tragedy or mayhem should do the trick. If you pick a book with an intense plot line, you may find yourself more stressed out than relaxed by the end of a few chapters! During the summer, I like to take a quiet walk after dinner. It releases a lot of the tension of sitting at my desk all day and gives my mind a chance to work problems and ideas out before I have to really settle down for sleep. On those rare occasions when I have the chance to start relaxing early in the evening, I’ll flip on the television and watch an episode of whatever my latest Netflix addiction is. It’s a great way to just veg out and relax. I admit it, I am secretly (or not so secretly!) addicted to word searches. They give my mind a chance to focus solely on scoping out the letters and discovering the hidden words. Word searches are systematic and force me to do one thing at a time instead of letting my mind race. I can’t even begin to tell you how many word search books I’ve completed! When a friend suggested I try meditating, I really wasn’t all that keen on it. Sitting for a long time and not doing anything? Yeah, that’s not exactly my strong suit. However, I’ve tried it a few times and, when I can get my mind to stop turning a million miles an hour, it does help me relax. There are meditating guides online and books that might help you if you’d like to give it a try. If it’s been a particularly stressful day, I’ve found that the most effective way to let go of the tension is with laughter. I’ll turn on a funny show, watch some crazy, funny videos on YouTube, or just have a funny conversation with my husband. The laughter releases the tension that’s been built up and gives me the peace I need to relax at night. The truth is that there’s no right or wrong way to relax at the end of the day. Whatever works best for you and calms your mind is the right choice. Here’s to productive, happy days and relaxing, quiet nights.